PacWest's moto: "UNBEATABLE WHOLESALE PRICES for Labor & Material Packages, Quality Installations & Production geared to meet construction schedules on any type & size of project. Specializing in Assisted-Livings, Senior Living Facilities, Apartments, Motels, Multi-Family Projects, Condominiums, Townhomes, Commercial Buildings, Tract or Custom Housing, PacWest Contracting LLC (PacWest) does it all. PacWest has 30+ years of solid experience in the Pacific Northwest, Southwest & western states subcontracting multi-trade labor & material packages on a wide range of projects. Our company only employs qualified installers and has the manpower, tools & equipment needed for fast-track production." Pacific West was searching for high quality pallet racks for their warehouse, which stored high quality construction supplies. Not only did this Utah company need to have high quality pallet racks, but they also needed to have pallet racks that were at a great and inexpensive price. Pacific West decided to do business with NationWide Shelving because NationWide Shelving is the best go-to local shelving company within the Salt Lake City valley. NationWide Shelving sells pallet racks with the best value and top of the line quality. NationWide Shelving also made it possible for Pacific West's pallet rack order to be delivered quickly,, from the time it took to ship from the manufactor to the time it arrived at the customer's warehouse. The Feature: NationWide Shelving pallet racks are made of high quality materials. 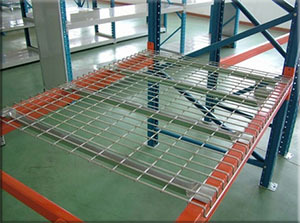 The Advantage: High quality pallet racks mean that the storage of items can suffice for years to come. Benefit: High quality pallet racks don't have to come at a high cost, since they won't have to be replaced for a long time. 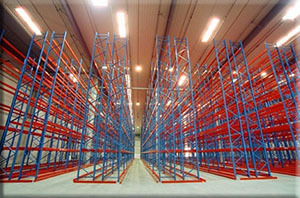 Return on Investment: Companies in Utah can increase profits, rather than later, because of high quality pallet racks. North American Wholesale Logistics (NAWL) manufactures pallet racks that offer warehouse managers an industrial strength rack solution with spectrum teardrop pallet rack beams, upright supports, and accessories which are in stock for quick shipping. Spectrum teardrop is priced just slightly above good quality used pallet racks, making it a viable solution to buying new rack vs used. Spectrum passes every test based on ANSI, MHIA, and RMI guidelines. Check out our pallet racks for sale "here"
If you need help ordering the right amount and sizing of pallet racking for your warehouse, and you would like a fast delivery and professional installation, ask for our sales department when you call. We will be able to configure drawings, and process product orders, to best fit your available space layouts in a timely manner.